Taipei, Oct. 28 (CNA) The largest lesbian, gay, bisexual and transgender (LGBT) conference in Asia opened Wednesday in Taipei, with local activists eager to learn from the experiences of other participants in combating discrimination and pursuing equal rights. 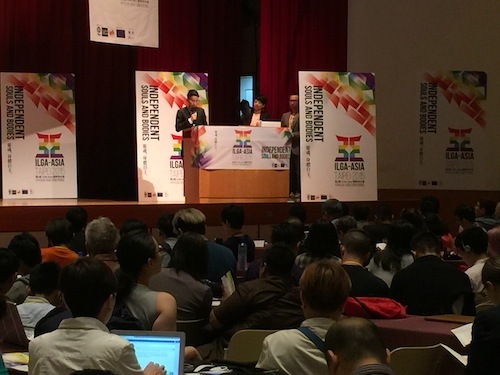 The 6th ILGA-Asia Regional Conference has drawn 300 activists from over 30 countries, and Wayne Lin (維尼), chairperson of the event's organizer, the Taiwan Tongzhi (LGBT) Hotline Association, sees it as a chance for Taiwan to share its experiences with the world and learn how LGBT issues are dealt with in other countries. "By learning from each other, we hope to bring our cooperation one step further and strengthen Taiwan's LGBT activism," Lin said at the opening of the three-day conference -- being held in Taiwan for the first time -- at the Chientan Overseas Youth Activity Center. Madeleine Majorenko, head of the European Economic and Trade Office in Taiwan, said the European Union sees Taiwan as a front-runner in the fight for LGBTI (lesbian, gay, bisexual, trans and intersex) rights and was proud to support the conference. "Through the sharing of experience and best practices, and the discussions on subjects of profound impact, together I think we will be able to strengthen the fight against LGBTI discrimination in Asia," said Majorenko. The EU provided 40,000 euros (US$44,131) in funding for the International Lesbian, Gay, Bisexual, Trans and Intersex Association-Asia's regional conference. The gathering will discuss such issues as marital equality, AIDS, health services, LGBT rights in Muslim societies, strategies to combat criminalization of homosexuality, and LGBT activism in Taiwan, Singapore, Vietnam, Thailand and other Asian countries. Among the participants are representatives from Human Rights Campaign, one of the largest LGBT advocacy groups in the United States, and the ASEAN SOGIE Caucus, a network of human rights activists in Southeast Asia that advocates for sexual and gender minorities. The first ILGA-Asia Regional Conference was held in 2002 in Mumbai, India. The conference has also been hosted in the Philippines and Indonesia and twice in Thailand. Founded in 1978, ILGA is a world federation of national and local organizations that work to achieve equal rights for LGBT people. It has over 1,200 members from over 110 countries.